Soraa, the world leader in GaN on GaN™ LED technology, announced that its full visible spectrum LED lamps have been installed in the new state-of-the-art Forrest E. Mars, Jr. Building at The Brinton Museum. 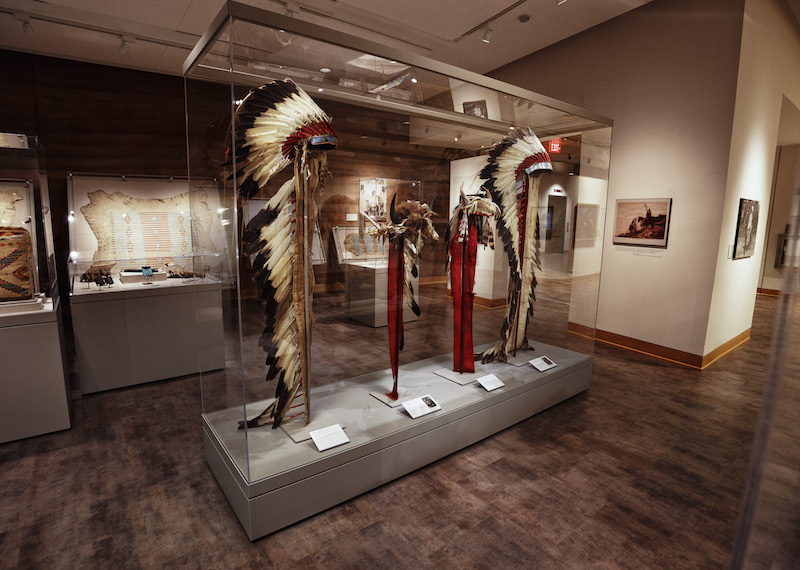 The company’s LED lamps were chosen to illuminate, protect and accurately render the colors of rare Native American artifacts exhibited in the $15 million 24,000 square-foot space, located in the foothills of the Bighorn Mountains. Jeffrey Leffeld Versakos, CEO of BandNY and LEDspin, wanted lighting to both protect the artifacts and define the space to reflect the beauty of the building. Versakos chose Soraa VIVID MR16 LED lamps to deliver true color rendering and protective qualities. In addition, Versakos opted for the Soraa SNAP system to better control the beam distribution. Rare tribal war shirts and ceremonial robes, hives, painted drums and other Plains Indian artifacts, many of which have natural pigments, are perfectly illuminated and protected by Soraa’s LED lamps. That’s because Soraa’s GaN on GaN™ LED with Violet-Emission 3-Phosphor (VP₃) LED technology renders the widest range of colors in the objects that we see, without ultraviolet (UV) or infrared (IR) radiation that can fade or harm the artifacts. “These are amazing, rare artifacts and we needed the ability to expertly and accurately light the collection displayed in this unique space. With no UV and IR radiation, as well as low heat output, Soraa LED lamps protect the objects. The SNAP System with magnetic accessories provides a flexible and easy way to perfectly customize the light for the artifacts and space,” said Versakos. Utilizing every color in the rainbow, especially deep red emission, Soraa’s lamps render warm tones beautifully and accurately, and achieve a color rendering index (CRI) of 95 and deep red (R9) rendering of 95. And unlike blue-based white LEDs without any violet emission, the company’s lamps have violet emissions to properly excite fluorescing brightening agents in natural objects. Versakos’ teams at BandNY and LEDspin managed the exhibition design and lighting. The three-story building is anchored by a two-foot thick, 51-foot high, 209-foot long arced structural, rammed earth wall, the tallest in North America. The lighting design with Soraa LEDs and SNAP system emphasize the exhibits and architectural building elements. The Soraa LED lighting plays an important role in the climate-controlled galleries, reducing energy usage and better preserving the museum’s collections. Located on the 620-acre historic Quarter Circle A Ranch in Big Horn, the eco-conscious museum houses one of the most significant and extensive 19th and 20th century Western and American Indian Art collections in the U.S., featuring Frederic Remington, Charles Russell, Thomas Moran, Edward Borein, Winold Reiss and the largest Hans Kleiber collection in the world. Skyline Engineering of Rapid City, South Dakota managed the lighting system and specified Soraa LED lamps. Soraa LED lamps have also been installed at the Staten Island Museum in New York, Victoria and Albert Museum in London and Historical Museum Bramberg in Germany. For more information on Soraa’s LED lighting products, please visit: www.soraa.com.